Jellalabad, the bastion where General Elphinstone and others were buried during the seige [sic] 1841-42.
bl.uk > Online Gallery Home	> Online exhibitions	> Asia, Pacific and Africa Collections	> Jellalabad, the bastion where General Elphinstone and others were buried during the seige [sic] 1841-42. 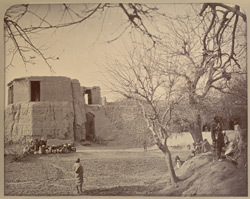 Photograph of the fort at Jalalabad, taken in Afghanistan by John Burke in 1878. Burke, an intrepid photographer widely travelled in the Indian sub-continent, is best known for his photography during the Second Anglo-Afghan War (1878-80). He entered Afghanistan in 1878 with the Peshawar Valley Field Force and during the two-year campaign worked steadily in the hostile environment of Afghanistan and the North West Frontier Province (now Pakistan), the scene of the military operations. Burke's photographs include many of the people of Afghanistan and his Afghan expedition produced an important visual document of the region where strategies of the Great Game were played out. The title of this photograph refers to the last resting place of General William Elphinstone, a commander in the First Anglo-Afghan War (1839-42). Old and ill, he had led the terrible retreat towards Jalalabad when many soldiers and civilians had been killed by Afghan fighters hiding in the hills. He finally surrendered as a hostage in exchange for safe passage for civilians and died of dysentery in captivity.